The baby activity centers are also referred to as play saucer/stationery play centers/exersaucer / stationery entertainer. Baby activity centers guarantee your baby is not moving, therefore, prevent your baby from dangers such as falling. They are used when the baby has good control of head and neck that’s why most of them are used for 6 months. Children start to crawl and scoot around the home at six months old. At this age, most moms realize it not possible to leave your child unattended and do some house chores in the house. Having Baby activity centers and entertainers makes thing possible it allows moms to do some task. Baby activity centers keep your child entertained and safe as you complete home chores. When you need a place to put your baby and attend other duties such as get dressed, take a shower baby activity center are perfect for this. A baby activity center has toys and other objects that keep your child entertained and engaged. Before buying check the appropriate age for baby activity centers some starts at birth and most of them you can start to use them from four months to two years. Buy Baby activity centers and entertainers that have different features such as toys. It helps your baby to learn and entertain themselves while doing some jobs in the house. It also helps your child increase skills, strong baby physically, assists the baby is growing properly and multiple senses. 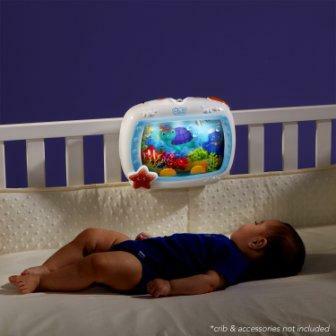 Some Baby activity centers and entertainers have light and sound that entertain your baby. When buying Baby activity centers and entertainers choose the one that you can increase the size as your kid grows. All baby products must be easy to clean. Choose an activity center that doesn’t have corners where dirt can hide. Also, to make cleaning easier you can find one that you can easily remove the toys or seat pad to clean. Baby activity centers and entertainers should not be bulky and hard to store. They should be easy to fold and transported from one place to another. Make sure it has firm footings safe for baby to walk with and jump. For security purposes, it is made from free-standing steel frames non-slip footings and doesn’t have to be secured by anything. It is safe for baby to walk with and jump. With multipurpose I mean an activity center that you can easily transform into a play mat or play table to be used when your baby grows to stand on their own two feet. Multipurpose factor helps a mom who worries to buy something, use for a few months and won’t get much use in the future. 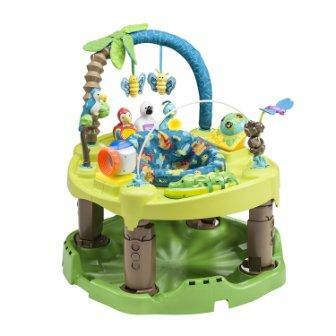 Activity center such as Evenflo ExerSaucer Triple Fun – Jungle can be converted as a play table, play mat or exersaucer. Baby activity center either use batteries or electricity to operate. Other doesn’t need any power to operate. Consider whether to buy an activity center that has a source of power that is available in your location and doesn’t cost much. Another feature in this product it has an electronic toy at the front which has motion, sound, and lights. It is activated by baby spinning a drum or parents can enable an option for four minutes of continuous playing. This product has many toys and animals including a tiger that plays hide and seek, a bobbling elephant, a parrot, and a spinning lizard that makes a rattling noise. It is easy to fold making it easy to store and move from one place and another. Looking for activity centers that are perfect for moms and babies on the go or right at home, with a travel bag, lightweight and compact fold Summer Infant Pop N’ Jump Portable Activity Center is the best choice. The activity center features interactive toys include spinner ball, rattle, teether and mirror book which help keep your baby active and entertained. Also has a soft fabric below their feet. In addition to features, the activity center has a UV canopy which protects your baby from sun harmful rays. This makes perfect for outside sun. For parents who fear to assemble things, the product has a lightweight frame which is easier to fold and comes fully assembled for a quick and easy portable set up. The jumping support seat is removable and machine washable. Its best fit for children from 6 to 12 months and can be adjusted to 3-different levels. 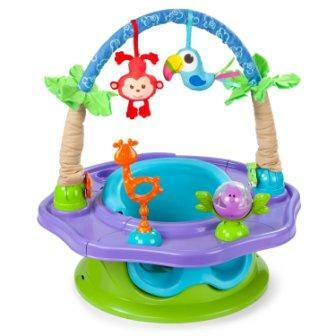 Skip Hop Activity Center includes an innovative attachment system clip which helps to position toy anywhere you want. The activity center has a discovery window which allows the baby to see their feet while playing. This helps to promote special awareness and teaching cause and effects. Multipurpose use will make this activity center a family favorite. It easy to assemble and can be converted as a sturdy table for coloring, playing and many more. With patented legs which fold easily allowing it goes everywhere and storing it in the trunk or closet. Swap the seat with the table top provided to convert activity center into a play table for toddlers up to 5 years. The activity center includes engaging toys that the baby will be busy with exploration. It features 360 degrees rotating seat and spinning plate on the base promoting body movement. 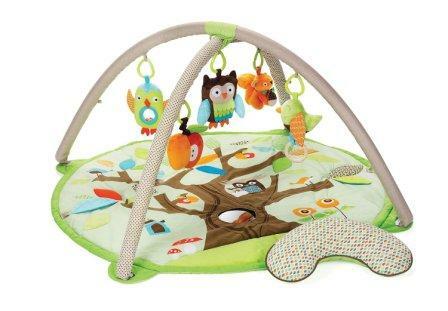 The Creative Baby Woodland Activity Center is suitable for 6 months and above. It requires 2 AA batteries to operate and can be adjusted to 3 height adjustments. The Disney Baby Mickey Mouse activity saucer has interactive toys that encourage baby to explore, grasps, reach, touch and pull. These toys include light up the sun, moon toy bar with hanging rectangle Mickey Mouse and Donald tuck toys. You can adjust 3-position height for growing babies. The seat rotates 360 degrees with removable seat pad which is machine washable. Made of plastic and polyester seat pad which makes Baby Einstein Activity Saucer machine washable. Contains 12+ activities which keep your baby entertained includes light-up piano with volume control and 3 play modes: melodies, piano notes and language learning in English, Spanish and French. The baby activity center can be adjusted 3 height adjustments to grow with baby. The most baby activity center comes with customized toys, but baby Einstein has link loops that allow mom to add more favorite toys. Looking for activity center and walker in one, Bright Starts Activity Center has this feature. The Baby has the freedom to walk around the perimeter of the table that’s loaded with a variety of activities. Made of strong durable plastic which makes baby activity center easy to clean. 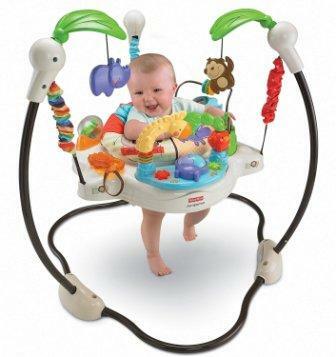 Best activity center that is suitable for 6 months and up or 30 inches tall. The seat rotates 360 degrees as the baby walk around play table. This activity center converts from a self-contained walker to a toddler activity table and requires a 3C battery. You easily remove the seat so baby can play and stand too. It has 15+ activities that keep your baby entertained includes piano station, popping character, bead chaser, spinner, and flip book to activate melodies. It contains 12+ activities which help baby achieve developmental milestones. The seat is machine washable with cold water, delicate cycle and line dry. 3- Position height adjustments which make the activity center grow with your baby. As the name says it is an excellent soother which has four soothing modes with volume control:-10 melodies with light-up and motion effects, melodies only, ocean sound with light-up and motion effects and ocean sound only. It keeps baby engaged and entertained. This product has unique Drift-off feature light and melody gradually soften after every 10 minutes as the baby drift off to sleep. This product is designed for the child who can hold his/ her head unassisted and not yet to climb out and walk. To entertain the baby, it has music, sounds, and light which mom can quickly turn on and off. For safety purposes, it is made from free-standing steel frames non-slip footings and doesn’t have to be secured by anything. It is safe for baby to walk with and jump. The seat height is adjustable, so it fits your baby growing leg. Also, the seat rotates around allows baby to look all around. It has 3 stage super seat Deluxe. The first stage the seat acts as a soft foam support seat that helps the baby to practice sitting up as he strengthens the back and neck muscles. The second stage is an activity seat with detachable toy bar. It has six playful toys to keep your kid entertained, and 360-degree rotating feeding tray attached to stage 1 support seat. The tray also has a handy snack tray with dual cup holders. The third stage is a booster seat with chair strap. The seat has an inbuilt chair strap which allows secure positioning to any standing chair can be used for feeding at the table. The booster seat is light and can be easily portable so that you can take it with you to a restaurant. It is designed for ages from 0 and above. It has five playful multi-sensory toys hanging toys. The product has supportive tummy time pillows and oversized round activity mat surface. It has playmat for age 0- 4 months, activity center for age four months to walking age and activity table for walking age to 2 years. You can remove the Toys and use on other Evenflo items. Baby activity centers and entertainers are the sources of entertainers to the child they keep them safe. Don’t keep your child for too long; keep your eyes on them because they are not babysitters.